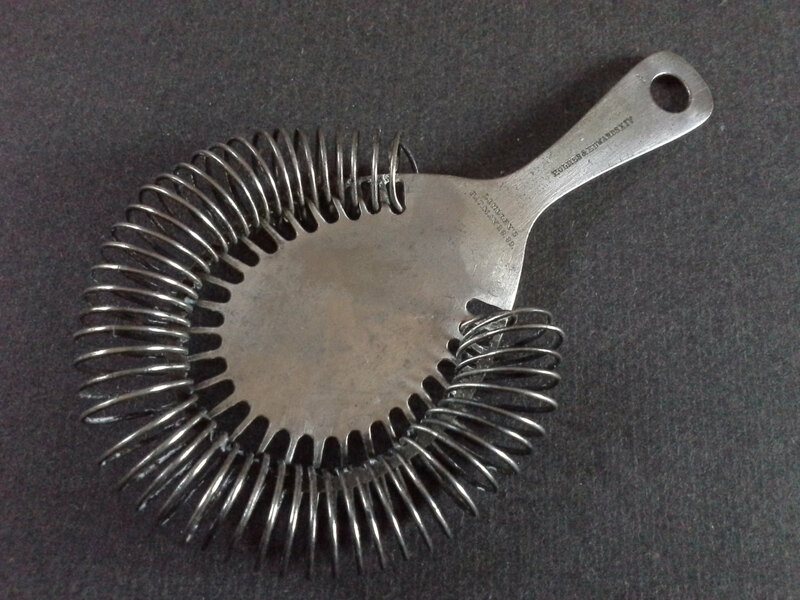 It had what I believed to be French hallmarks and had a wire ring that was the same as contained in William Wright’s 1892 patent for a strainer; this type has since been called a “Hawthorne” strainer. It had the same opening in the side of the wire ring as Wright had called for in his patent. However, the coil that was supposed to slip over the wire ring was missing. 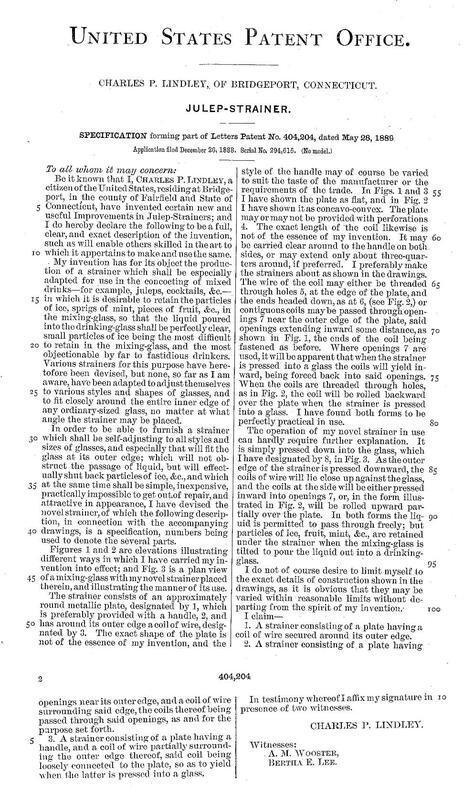 In his patent, William Wright mentioned that the opening in the ring was to allow for removal of the coil in order to clean it. It seems someone removed the coil on this strainer and never replaced it. 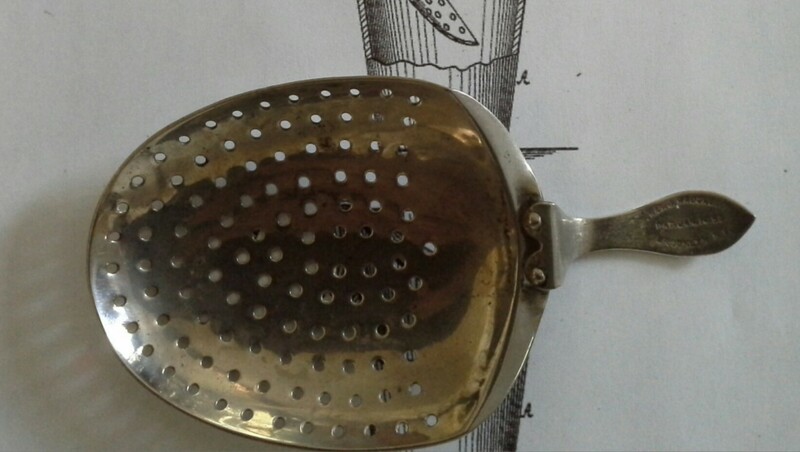 I researched French silver marks looking for the “L & F” mark that was on this strainer. Perhaps it was Le Jean & Froidure, but I was not sure. 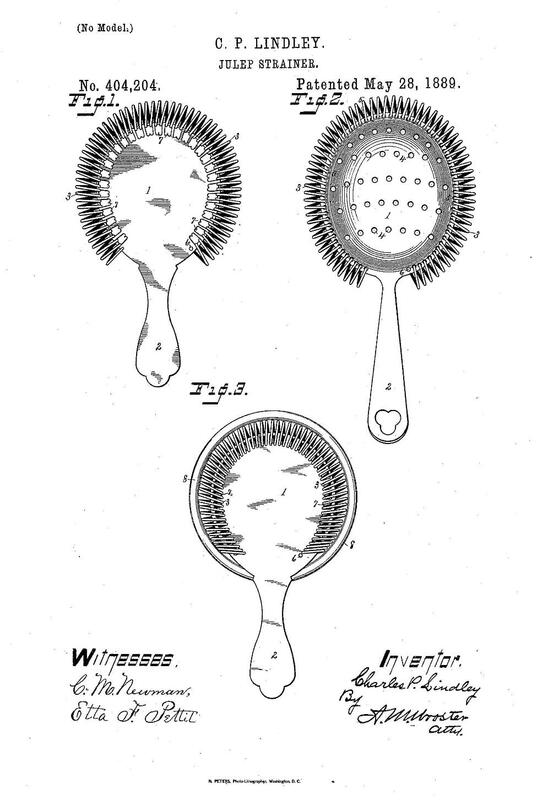 So I kept searching and found several interesting cocktail strainer patents that I thought I’d share here. 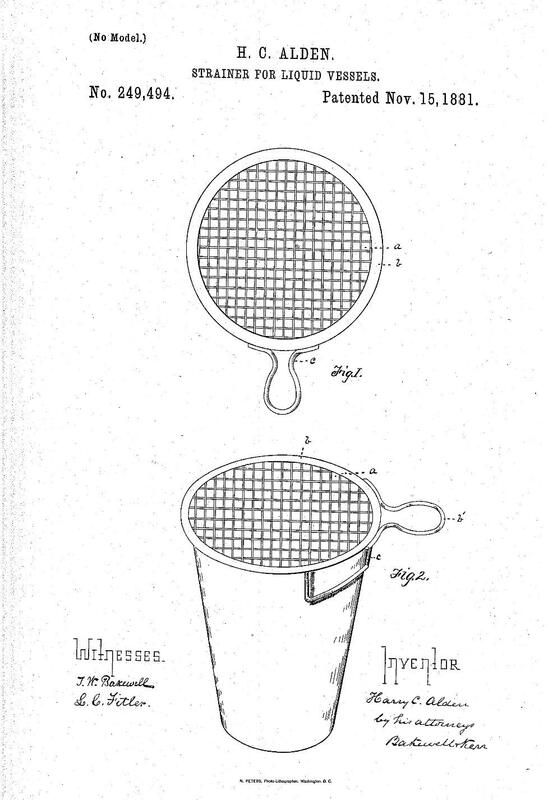 This 1881 patent by H. C. Alden was for a strainer with a very short handle and what he calls a “web” type strainer. 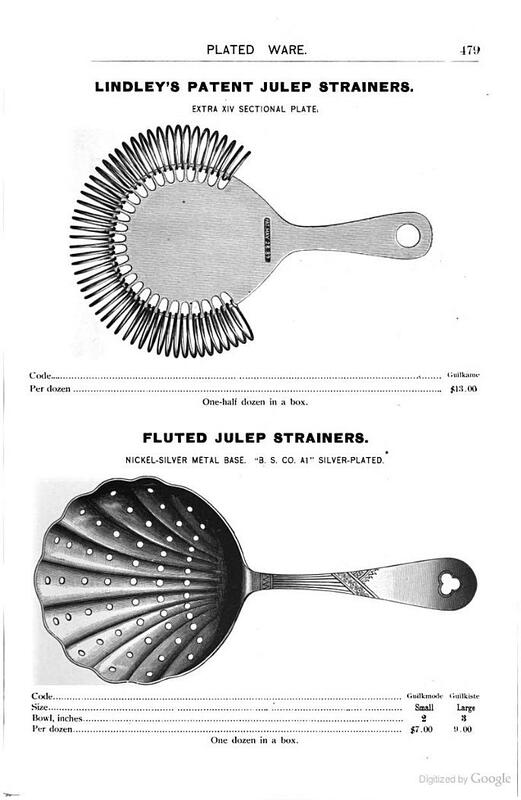 What is interesting in his patent is that he mentions that “heretofore the kind of strainer most commonly used … was a scalloped or shell-shaped spoon provided with perforations….” The strainer he was describing was a scalloped julep strainer which is still popular today. 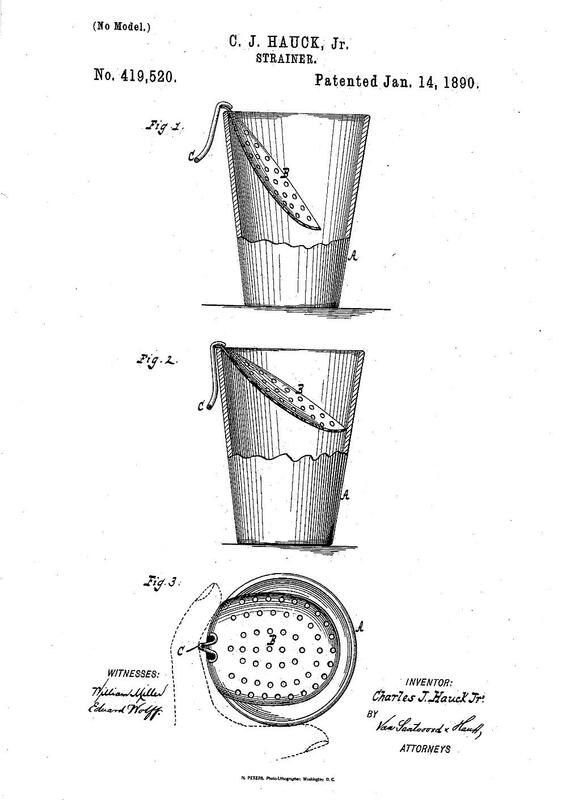 Alden’s patent is proof that the scalloped shaped julep strainer was being used earlier than commonly thought today. 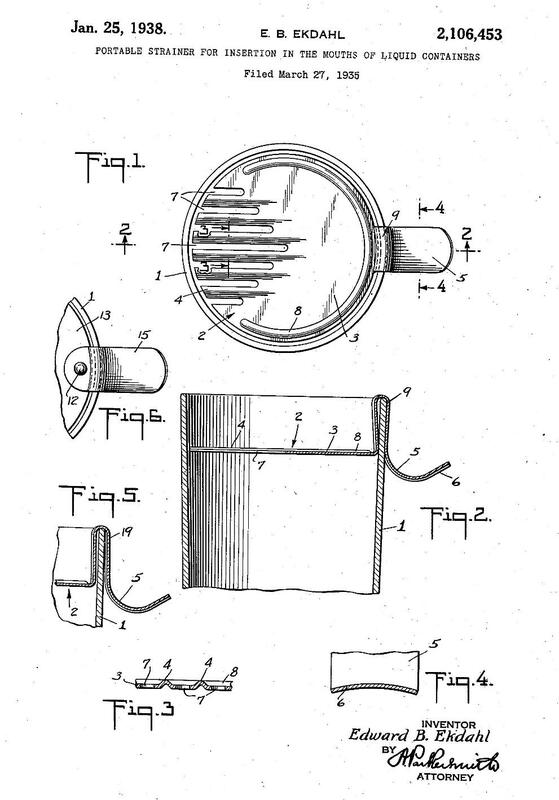 And this rather strange looking strainer patented by C. B. Hopkins was to be used by the person drinking to protect his mustache. It could also be used to strain liquid from a chamber into another glass. 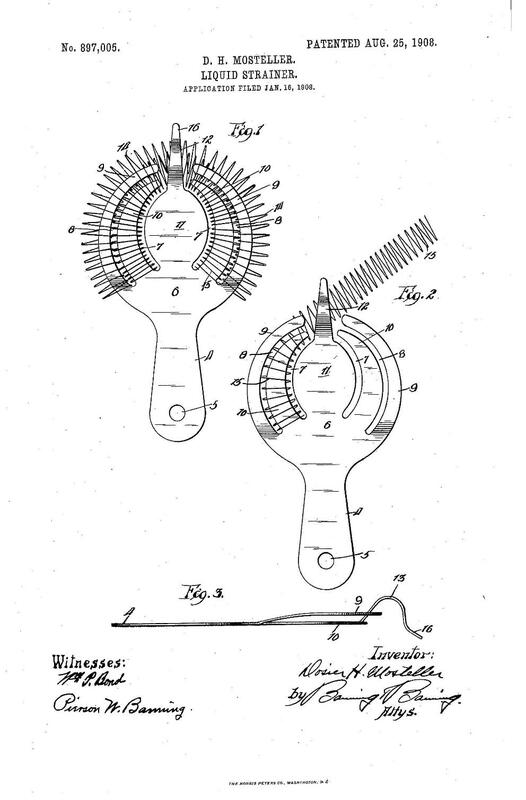 As far as I know, this 1889 C. P. Lindley patent is the first U. S. patent to utilize the coil edge feature. His detail leaves much flexibility as to the design which is evident in the drawings shown above. Note the variations in bowl and handle. 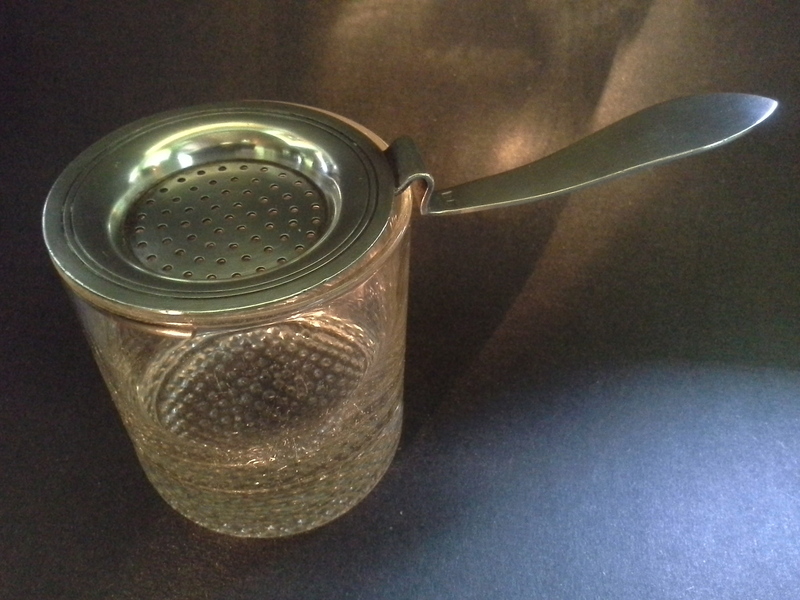 Following is a photo of the actual Hauck strainer which I have sold. Very interesting indeed! This 1892 William Wright strainer is the one known as the Hawthorne strainer. 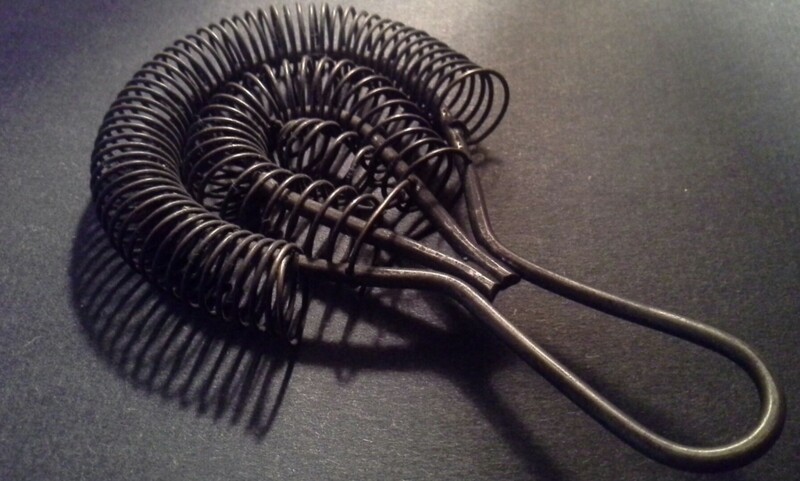 Wright’s coil goes completely around the strainer and it is supported by a wire ring. 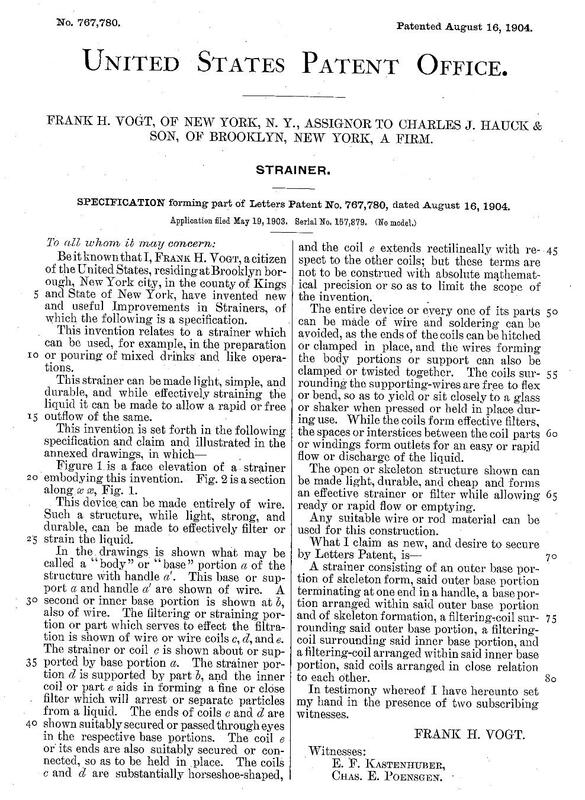 Figure 4 of his patent shows the strainer with the coil removed. You can see the separation of the ends of the wire ring at “e” (very similar to my French strainer). Mr. Wright claims the purpose for the ring being “divided or disconnected” at the ends was to allow for the removal of the coil for cleaning purposes. The handle had several “corrugations” that would allow for various size vessels. This patent was assigned to Dennis P. Sullivan of Boston, Massachusetts, who just so happened to own “The Hawthorne, Gentlemen’s Cafe and Restaurant”. 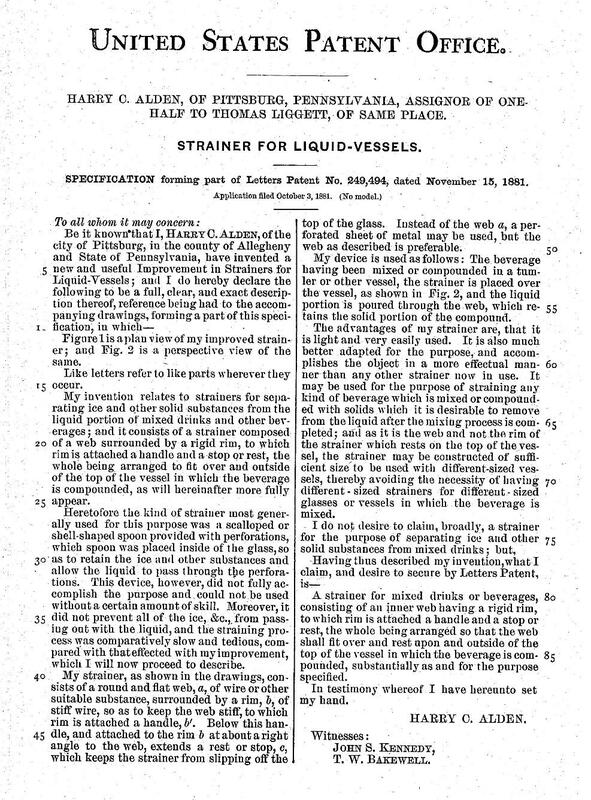 The following article is taken from the Aprill 26, 1894 issue of “The Iron Age”. 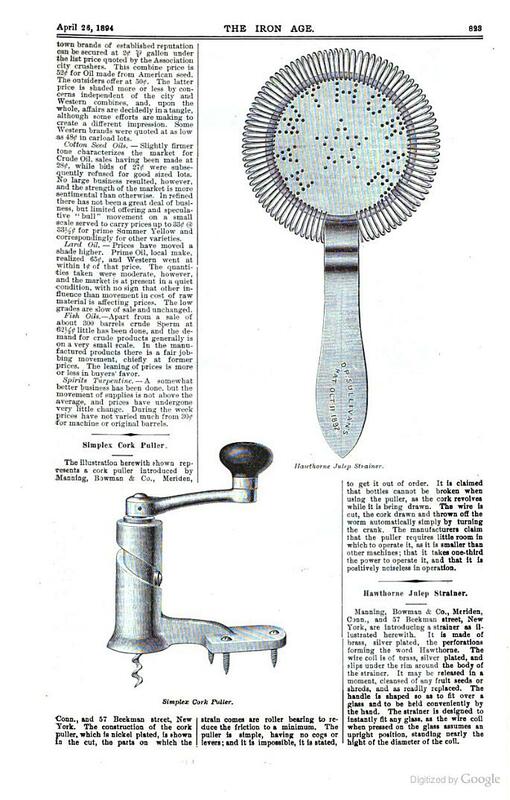 It shows an illustration of the Hawthorne strainer with “D. 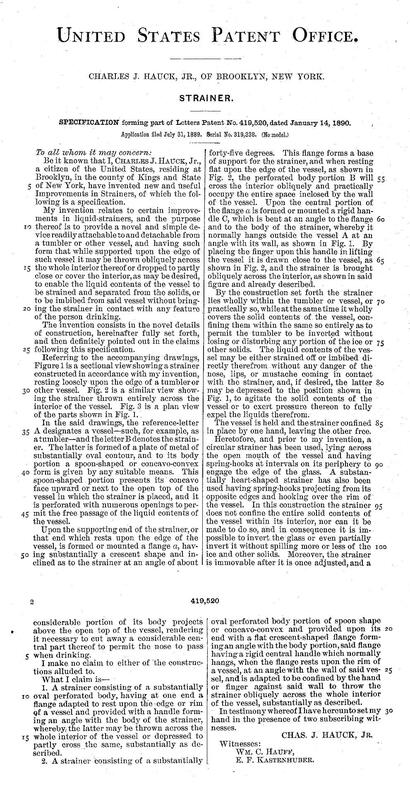 P. Sullivan’s” and the patent date on the handle. 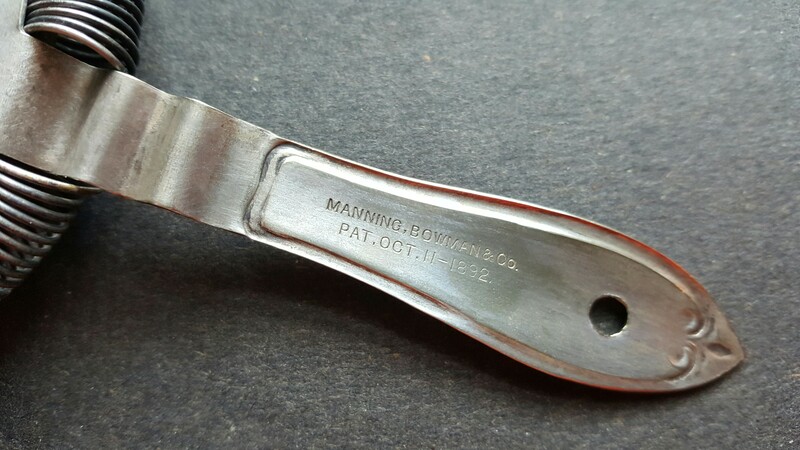 Below the illustration it reads that this “Hawthorne Julep Strainer” was being manufactured by Manning, Bowman & Co. of Meriden, Connecticut. It was constructed of silver plated brass. This 1904 F. H. Vogt strainer was comprised of inner and outer sections of coiled wire. 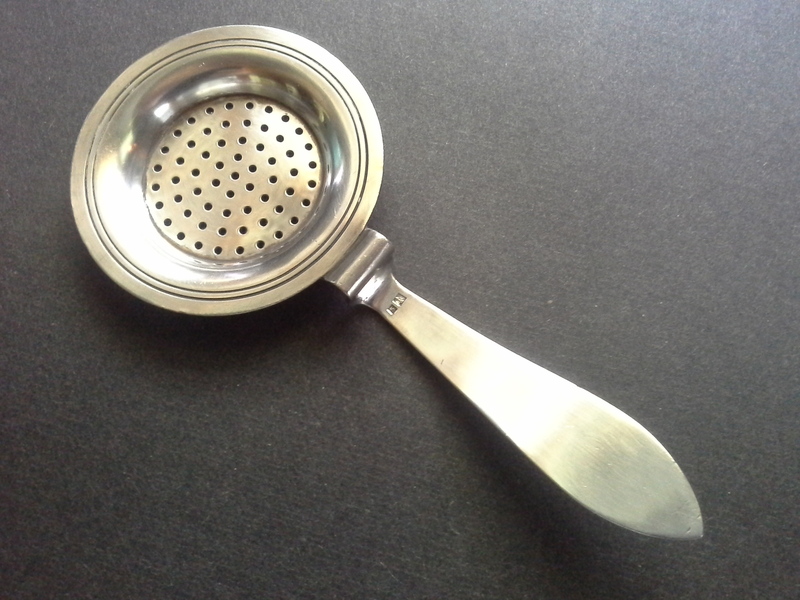 This strainer was claimed to be very light, simple to use and durable. Note that this Vogt strainer was assigned to Charles J. Hauck & Son. 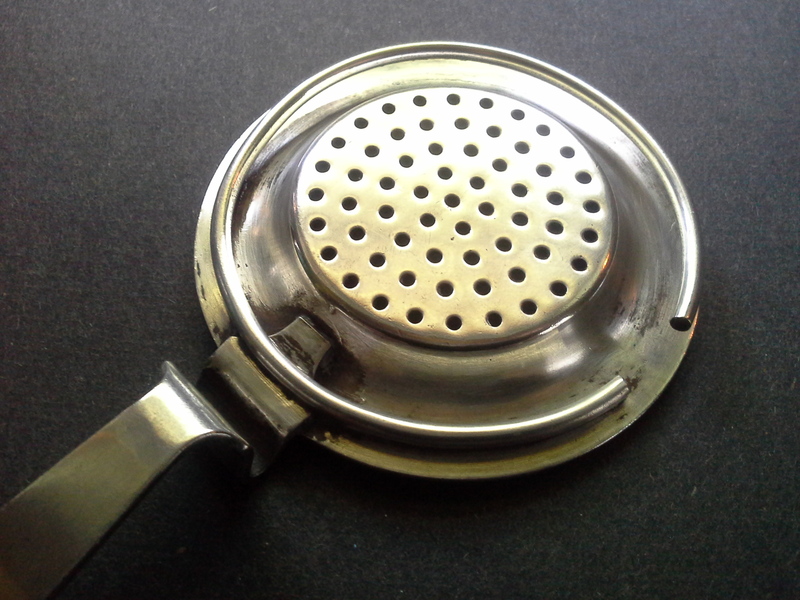 Following is a photo of the Vogt strainer which I have sold. 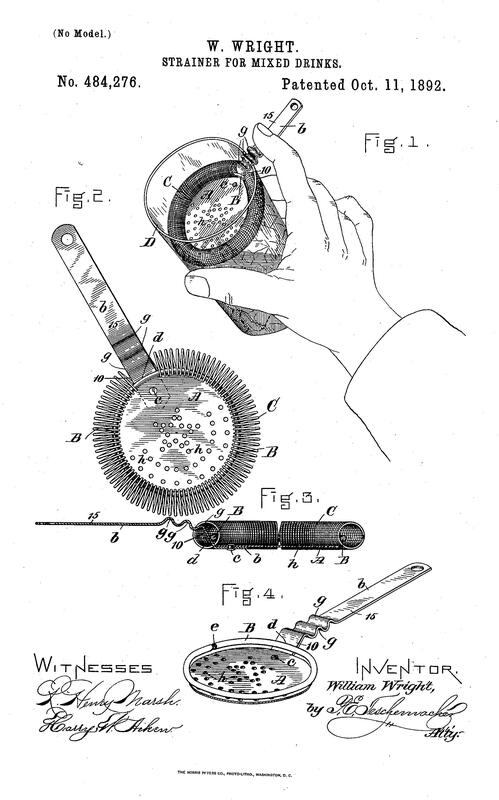 I don’t know that I would recognize this as a cocktail strainer if I didn’t have the patent information and illustration. 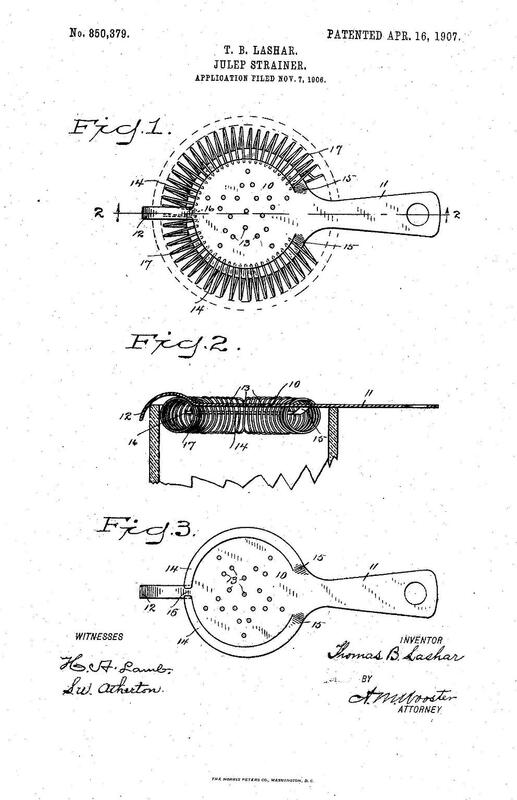 This 1907 Thomas Lashar patent is interesting in that the handle comes straight off the strainer. There is no dip or corrugation on the handle; there is a curved lip or hook at the opposite end that “engages” the top of the glass. 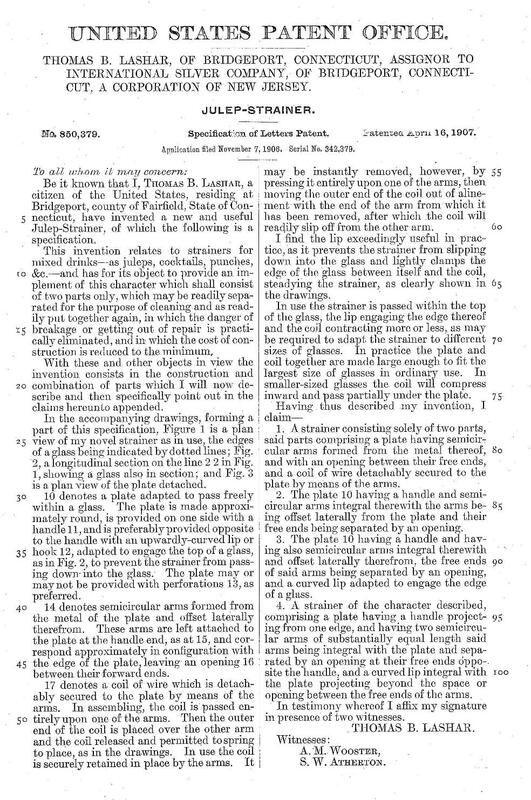 Note that this Lashar patent was assigned to International Silver of Bridgeport, Connecticut. In 1907 Holmes & Edwards of Bridgeport was an International Silver company and I believe this patent was assigned to them. And lastly, another coil themed strainer, this one in 1908 by D. H. Mosteller. 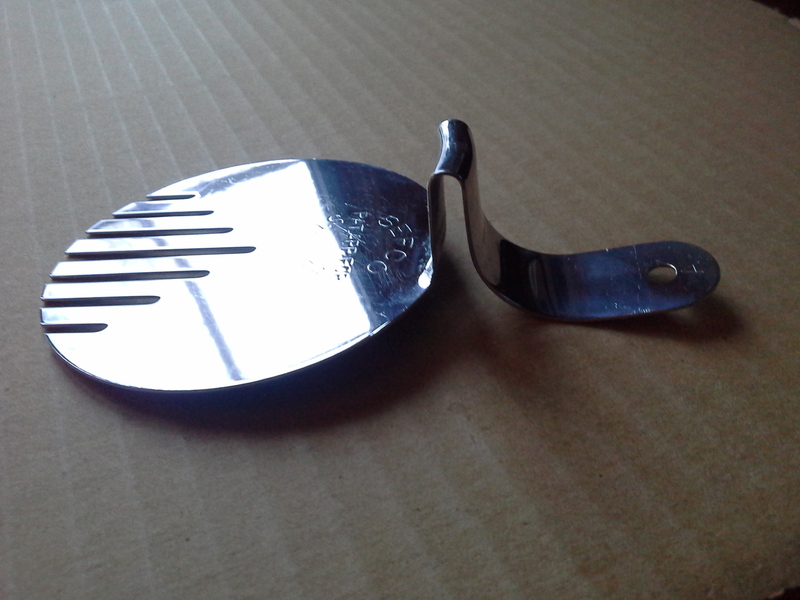 This design was to allow the strainer to accomodate a small whisky glass and for larger shakers as well. 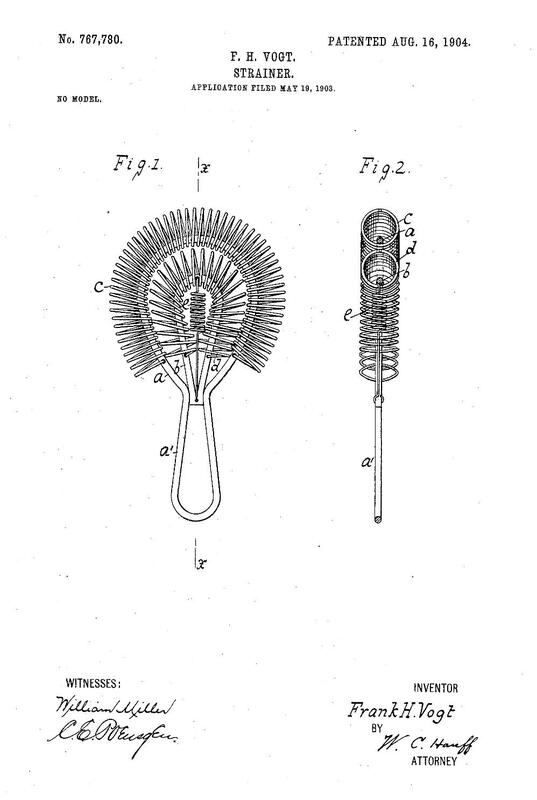 This patent was assigned to the Mosteller Manufacturing Company of Chicago, Illinois. 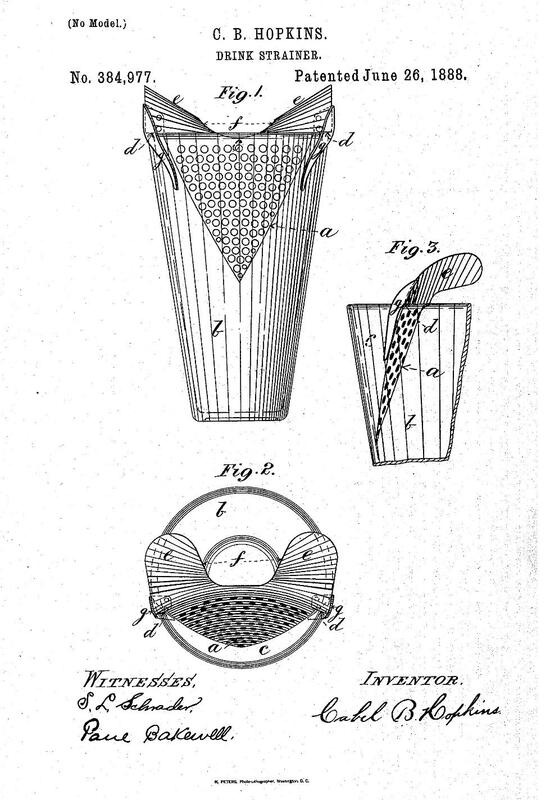 The following strainer patent is from the 1930’s. It appears to be functional and yet have a sleek, art deco design. This Ekdahl design was manufactured by Sefco, Inc. 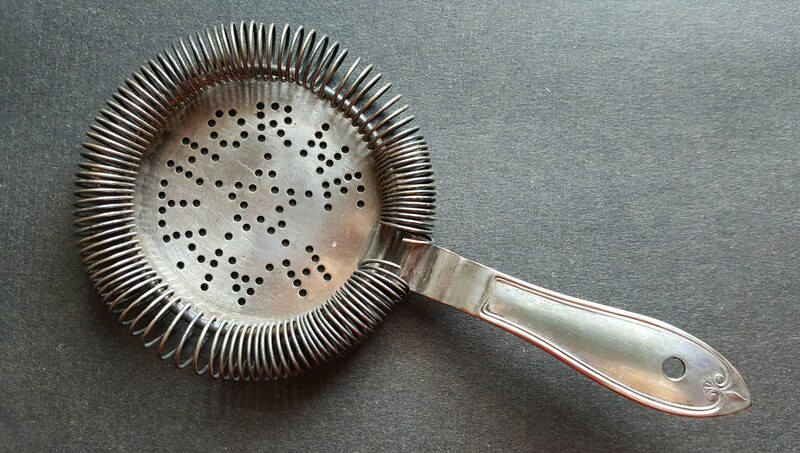 This Sefco strainer is for sale at my Etsy shop, https://www.etsy.com/listing/220509418/sefco-antique-cocktail-strainer-patent . 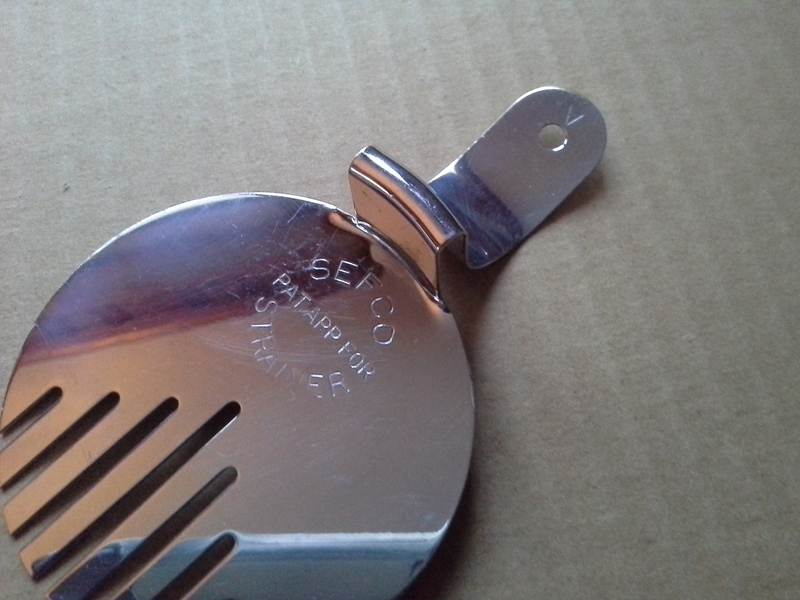 With regard to my French cocktail strainer, I don’t know if its design with the wire ring was borrowed from William Wright’s patent or if Mr. Wright was inspired by a French design. 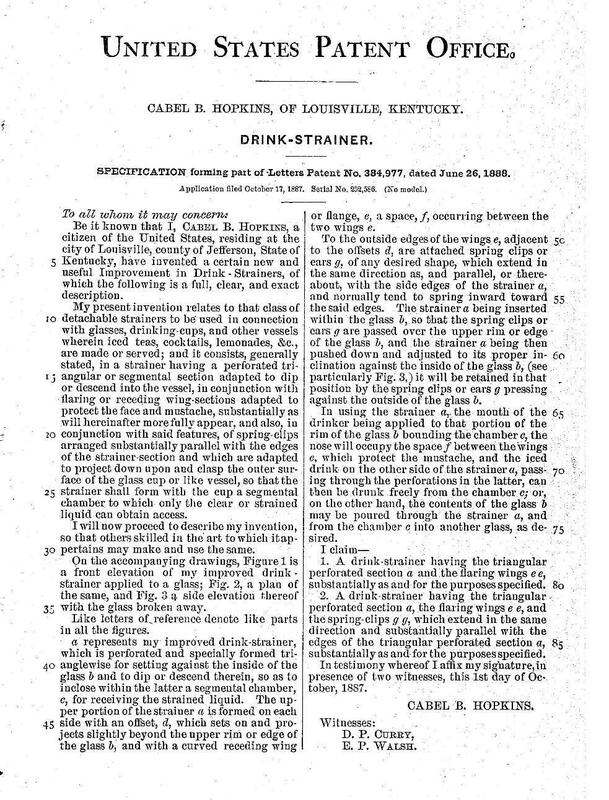 This entry was posted in Alden strainer, bar tool, bartender, barware, C. J. Hauck & Son, Charles J. Hauck, Chas. J. Hauck, cocktail, cocktail strainer, cocktail strainer France, Dennis P. Sullivan, Etsy, F. H. Vogt, French cocktail strainer, Hawthorne strainer, holmes & edwards, julep strainer, Late 1800's, Late 19th Century, Lindley Strainer, Mosteller strainer, mustache drink strainer, silverplate, T. B. Lashar, Thomas Lashar, Wright strainer and tagged Alden strainer, bar tool, bartender, barware, C J Hauck, cocktail strainer, cocktail strainer France, Dennis P. Sullivan, F. H. Vogt, French cocktail strainer, Hawthorne strainer, holmes & edwards, julep strainer, Lindley strainer, Mosteller strainer, T. B. Lashar, Thomas Lashar, Wright s trainer. Bookmark the permalink. It seems like everyone was trying to “build a better mousetrap,” so to speak. I’m amazed at the different gadgets and designs for all these household items but then I think about the infomercials of today, hawking specialized kitchen gadgets, and I guess it isn’t so different (tackier but not that different)!